By Tsukihime, May 5, 2012 in Completed Scripts/Plugins/etc. Your map has a name. You can give regions on your map names as well now. If you prefer yanfly's gab window you may include that. First tile your map with region tiles. 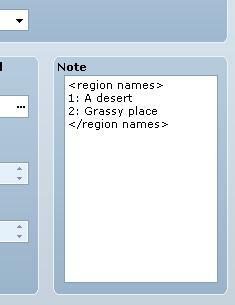 Corresponding to the regions you used. Yanfly's region battleback for saving me the time to write most of the code. Thats actually pretty cool. It'll be good especially for an open world rpg. Nice work. The name is only displayed once unfortunately. Yes it's displayed only when you enter a region. I was thinking of random encounters : it's a wide map, I'd like the player to be advise of the area name for fighting purposes and not localization. It seems to be built with the Gab Window in mind but I'll have another look at it. The other way around. I just grabbed that gab window cause it was conveniently there and saved me the effort of writing code for the map name display. Maybe have it pop up after each battle? Maybe have it just remain in the corner of the screen? Or a map name window in your party menu? Sorry, but is there a way to make the names display in menu, and not pop up on screen? Or is there another script for something like that? Hey great script! is there anyway I can make the name appear on the top left like the regular display names? Edit: Don't worry I figured it out! Is there a way to turn off the display with a switch? I don't want the player to know the names of the areas until they get a special item. Awesome! Is this available for commercial use? Actually, one other question... How would I modify this script so that instead of popups occurring, I could add a window into the party menu stating which region I'm in, in addition to the map name? My sincerest apologies. It's been so long since I've been on here I've completely forgotten. Names of Regions are not showing! Test it on a new project. Great script though it didn't work for me lol. I really like it tho. WOWOOWOWWOW!!!!!!! sorry for the spamm but this is wooow! amazing! TYTYsomuch!! welldone mate!